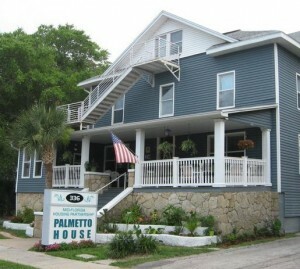 Palmetto House, with its forty-eight rooms, is the largest temporary housing facility in Volusia and Flagler Counties. Its purpose is to facilitate the movement of homeless families and individuals to permanent housing within a reasonable amount of time (usually 24 months). Temporary housing is primarily designed to serve homeless families with children and individuals in accordance with HUD's Office of Community Planning and Development (CPD) programs or functions. Supportive services provided to clients are case management, goal setting, counseling, life skills, alcohol/drug abuse services, mental health service referrals, other related health services referrals, Embassy of Hope assistance, Adult Basic Education, GED, HUD Certified Credit Counseling, Money Management workshop, Small Business Development classes, and permanent housing assistance. Drug screening is mandatory prior to entry and random thereafter. Participants must comply with strict house rules and make progress in meeting their established goals. Posting Comments below is for viewers on this website only. If you have information that can help users regarding Palmetto House Daytona Beach Transitional Housing, please provide it below.